Donald Kent "Deke" Slayton (March 1, 1924 – June 13, 1993; Major, USAF) was an American World War II pilot, aeronautical engineer, and test pilot who was selected as one of the original NASA Mercury Seven astronauts, and became NASA's first Chief of the Astronaut Office. 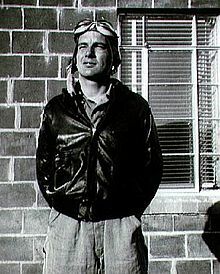 Slayton join the U.S. Army during World War II, and flew in Europe and the Pacific. 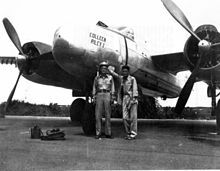 He left the Army after World War II, and later joined the Minnesota Air National Guard after working for Boeing as an aeronautical engineer. He joined the U.S. Air Force, and attended the Air Force Test Pilot School in 1955. In 1959, he applied to, and was selected as one of the Mercury Seven. He was scheduled to pilot the second U.S. manned orbital spaceflight, but was grounded in 1962 by atrial fibrillation, an irregular heart rhythm. He then served as NASA's Director of Flight Crew Operations, and was responsible for NASA crew assignments. In March 1972, he was medically cleared to fly, and flew as the docking module pilot of the 1975 Apollo–Soyuz Test Project (ASTP). He continued to work at NASA until 1982, and helped develop the Space Shuttle. He died from a brain tumor on June 13, 1993. After he began at NASA, Slayton was assigned to the development of the Convair Atlas LV-3B. :98 In 1959, he was training in a centrifuge, and underwent an electrocardiogram; it was found that he had erratic heart activity. He received further medical evaluation at Brooks Air Force Base, and was diagnosed with idiopathic atrial fibrillation, but was considered healthy enough to continue flying. :78–79, 85–86 During the unmanned Mercury-Atlas 4 orbital spaceflight, he worked at the tracking station in Bermuda. He was selected for the second American manned orbital mission, Mercury-Atlas 7, which he intended to name Delta 7.:104–105, 110 In early 1962, NASA Administrator James Webb opened an investigation in Slayton's atrial fibrillation. On March 15, 1962, two months prior to the launch of Delta 7, Slayton was medically disqualified from his flight, and was replaced on the mission by Scott Carpenter. :111–114 Initially, Slayton's ineligibility was only for his assigned mission, and he attempted to improve his health by exercising more regularly and abstaining from drinking alcohol. NASA leadership determined that Slayton was still at risk for his atrial fibrillation, and removed him from potentially flying on the remaining Mercury missions. :115–116 Flight doctors recommended a cardiac catheterization to determine if he had a congenital condition, but NASA leadership rejected the proposal because of the potential risks of the operation. In 1991, Slayton began working with space historian Michael Cassutt to write his autobiography, titled Deke! : U.S. Manned Space from Mercury to the Shuttle, which was published in 1994, a year after his death. :343 Slayton also co-wrote the 1994 book Moon Shot: The Inside Story of America's Race to the Moon with fellow astronaut Alan Shepard. In 1992, Slayton was diagnosed with a malignant brain tumor. On June 13, 1993, he died in his home in League City, Texas from the illness, at the age of 69. During and after his career, Slayton received numerous awards from different organizations. He received the Society of Experimental Test Pilots (SETP) James H. Doolittle Award in 1972 and the SETP Iven C. Kincheloe Award. In 1975, he received the National Institute of Social Sciences Gold Medal, the Zeta Beta Tau’s Richard Gottheil Medal, and the Wright Brothers International Manned Space Flight Award. In 1976, he received the Veterans of Foreign Wars National Space Award, the American Heart Association's Heart of the Year Award, the District 35-R Lions International American of the Year Award, and the AAS Flight Achievement Award. In 1977, he received the AIAA Special Presidential Citation, the University of Minnesota's Outstanding Achievement Award, and the Houston Area Federal Business Association's Civil Servant of the Year Award. Slayton, along with Brand and Kubasov, won the FAI Yuri Gagarin Gold Medal in 1976. Additionally, he received the Collier Trophy, the Gen. Billy Mitchell Award, and the AIAA Haley Astronautics Award for 1978. Slayton received an Honorary D.Sc. from Carthage College in 1961, and an Honorary Doctorate in Engineering from Michigan Technological University in 1965. He was a fellow of the SEPT and the American Astronautical Society, as well as an associate fellow of the American Institute of Aeronautics and Astronautics. He was a member of the Experimental Aircraft Association, the Space Pioneers, the Confederate Air Force, the Order of Daedalians, the National Rifle Association of America, the Veterans of Foreign Wars, and the Fraternal Order of Eagles. Additionally, he was an honorary member of the American Fighter Aces Association, the National WWII Glider Pilots Association and the Association of Space Explorers. 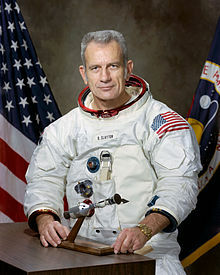 Deke Slayton was inducted into the U.S. Astronaut Hall of Fame on May 11, 1990, the International Space Hall of Fame in 1990, the National Aviation Hall of Fame in 1996, and the International Air & Space Hall of Fame in 2001. The Texas Oncology-Deke Slayton Cancer Center in Webster, Texas is named in his honor. The main stretch of road in League City, Texas, FM 518, was renamed Deke Slayton Highway. The Deke Slayton Memorial Space & Bicycle Museum in Sparta, Wisconsin was named in his honor. The Slayton biographical exhibit includes his Mercury space suit, his Ambassador of Exploration Award, which showcases a lunar sample, and more. In nearby La Crosse, Wisconsin, an annual summer aircraft air show, the Deke Slayton Airfest, has been held in his honor, featuring modern and vintage military and civilian aircraft, along with NASA speakers. The Cygnus CRS Orb-3 mission, which was lost when the Antares rocket exploded during its launch, was named the S.S. Deke Slayton. The Cygnus CRS Orb-4 Orbital ATK space vehicle was named the S.S. Deke Slayton II and launched to the International Space Station on December 6, 2015 on an Atlas V rocket. ^ The United States Navy required its pilots to have a college degree. ^ a b c d e f Gray, Tara. "Donald K. "Deke" Slayton". 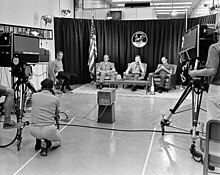 NASA History Program Office. Retrieved October 6, 2016. ^ a b c d e f g h i j k l m n o p q r s t u v w x y z aa ab ac ad ae af ag Slayton, Donald; Cassutt, Michael (1994). Deke! U.S. 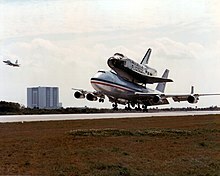 Manned Space from Mercury to the Shuttle. New York, New York: Tom Doherty Associates, Inc. ISBN 0-312-85503-6. ^ a b c d "Flew on the Apollo-Soyuz Test Project mission". New Mexico Museum of Space History. Retrieved October 6, 2016. ^ a b c d "Deke Slayton" (PDF). NASA. June 1993. Retrieved March 29, 2019. ^ "Donald K "Deke" Slayton". Wisconsin Aviation Hall of Fame. Retrieved August 8, 2013. While at Edwards, Deke Slayton flew test flight missions on the F-101, F-102, F-105 and the F-106. ^ Kranz, Gene (2000). Failure Is Not an Option: Mission Control from Mercury to Apollo 13 and Beyond. New York: Simon & Schuster. ISBN 0-7432-0079-9. LCCN 00027720. OCLC 43590801. ...[H]e was one of the hot test pilots at Edwards Air Force Base, pushing the F-105 to its limits. ^ Carpenter, Scott; Cooper, Gordon; Glenn, John; Grissom, Virgil; Schirra, Walter; Shepard, Alan; Slayton, Donald (1962). We Seven. New York City: Simon and Schuster. ISBN 978-1-4391-8103-4. ^ "Deke Slayton at Orbital ATK" (PDF). Archived from the original (PDF) on November 25, 2015. Retrieved November 30, 2017. ^ a b c Altman, Lawrence K. (April 27, 1972). "Deke Slayton Studies Russian and Dreams of Space". New York Times. Retrieved June 14, 2018. ^ Compton, W. David (1989). Where No Man Has Gone Before: A History of Apollo Lunar Exploration Missions. Washington, DC: NASA. SP-4214. Retrieved January 4, 2019. ^ a b Stafford, Thomas; Cassutt, Michael (2002). We Have Capture. Washington, DC: Smithsonian Institution Press. ISBN 978-1-58834-070-2. ^ Abell, John C. (September 9, 2009). "September 9, 1982: 3-2-1 … Liftoff! The First Private Rocket Launch". Wired.com. Condé Nast. Retrieved August 8, 2013. ^ Shepard, Alan; Slayton, Deke (1994). Moon Shot: The Inside Story of America's Race to the Moon. Atlanta: Turner Publishing Company. ISBN 1-878685-54-6. ^ a b Burgess, Colin (2011). Selecting the Mercury Seven: The Search for America's First Astronauts. New York: Springer. doi:10.1007/978-1-4419-8405-0. ISBN 978-1-4419-8404-3. LCCN 2011925650. OCLC 747105631. ^ Wilford, John Noble (June 14, 1993). "Donald Slayton Dies at 69; Was One of First Astronauts". The New York Times. p. B9. Retrieved April 8, 2019. ^ "Edwards Commander Awarded Medals". The Bakersfield Californian. Bakersfield, California. October 1, 1976. p. 9 – via Newspapers.com. ^ "Members, United States". Association of Space Explorers. Retrieved January 4, 2019. ^ "Donald K. (Deke) Slayton". Astronaut Scholarship Foundation. Retrieved January 4, 2019. ^ Sheppard, David (September 27, 1990). "Slayton to Join Space Hall of Fame". El Paso Times. El Paso, Texas. p. 9. Retrieved April 8, 2019 – via Newspapers.com. ^ "National Aviation Hall of fame: Our Enshrinees". National Aviation Hall of Fame. Retrieved April 8, 2019. ^ Sprekelmeyer, Linda (2006). These We Honor: The International Aerospace Hall of Fame. Donning Co. Publishers. ISBN 978-1-57864-397-4. ^ "Texas Oncology-Deke Slayton Cancer Center". 2019. Retrieved April 8, 2019. ^ "Bobbie Slayton dead at 65". Bay Area Citizen. Houston, TX: Houston Community Newspapers. November 29, 2010. Retrieved April 8, 2019. ^ "Homepage". Deke Slayton Memorial Space & Bicycle Museum. Retrieved January 5, 2019. ^ "ISS Commercial Resupply Services Mission (Orb-3): Mission Update – October 22, 2014". Orbital Sciences. October 22, 2014. Archived from the original on October 25, 2014. Retrieved October 24, 2014. ^ Clark, Stephen (October 31, 2014). "First stage propulsion system is early focus of Antares investigation". Spaceflight Now. Retrieved April 23, 2019. ^ Foust, Jeff (December 6, 2015). "Atlas Launches Cygnus Cargo Spacecraft to Space Station". SpaceNews. Retrieved April 23, 2019. ^ Cooper, Steve (October 2, 1983). "Scott Paulin had the 'Right Stuff' for role in film". The San Bernardino County Sun. San Bernardino, California. p. D-1. Retrieved April 8, 2019 – via Newspapers.com. ^ Grantham, Loretta (July 9, 1995). "NASA's true, amazing, out of this world G-whiz forces". The Palm Beach Post. West Palm Beach, Florida. p. 4D. Retrieved April 8, 2019. ^ "Made-For-TV Movie". Reno Gazette-Journal. Reno, Nevada. July 18, 1999. p. 12 – via Newspapers.com. ^ Kiss, Tony (April 5, 1998). "Space Race Revisited". Asheville Citizen-Times. Ashevill, North Carolina. p. D1. Retrieved April 8, 2019. ^ Morabito, Andrea (June 20, 2015). "Astronaut Wives Club' fires up ABC". New York Post. Retrieved April 8, 2019. ^ Snowden, Scott (October 4, 2018). "'First Man' Offers an Emotional Account of Neil Armstrong's Life (Film Review)". Space.com. Retrieved January 4, 2019. Wikimedia Commons has media related to Deke Slayton.